It's time WE teach Lansing a lesson! Parents and teachers: It’s time WE teach Lansing a lesson…we’re in charge of our children’s future. Please read this post and contact your legislators TODAY! Legislators are framing the move as an attempt to give control of testing the state’s students to a “more responsive” department, as Rep. Bob Genetski (R-Saugatuck) phrased it while testifying in support of his bill, House Bill 5581. “The legislature has had some challenges in dealing with the department of education, most recently with the testing of our students statewide and the assessments we are obligated to do through the federal government,” Genetski said. But according to Ben Smith at MLive that isn’t all that is moving to treasury. So we’re going to move the non-responsive culture at MDE to Treasury? Brilliant. What test will Gov. 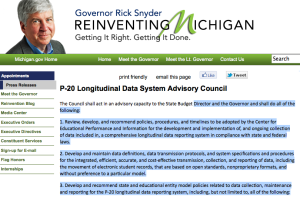 Snyder try and convince the non-responsive staff to implement? Will we get the “new” MEAP suffed with SBAC content? Implementing ACT Aspire is far worse. 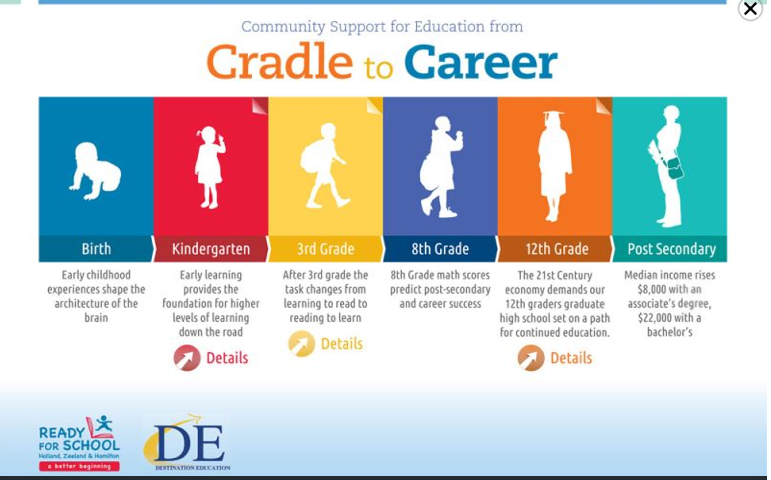 The ACT Aspire is common core aligned and purchased as written. Michigan loses complete control. What is tested is what is taught, what is taught is what thought. Michigan parents and teachers know that if we lose control of the assessments we lose control over what is taught to our children. Lansing does not seem to care about parents, pleasing the feds is their priority. It is not just the MDE that has been non-responsive to the legislature; the legislature has not been non-responsive to parents and teachers who do NOT want Common Core or any assessment aligned to it! 3. OPT OUT of SBAC, ACT Aspire, the “new” MEAP, or any Common Core aligned tests. 4. Share this post with everyone you know. Do not let Lansing play politics with our children’s education and future. Where does Gov. Snyder stand on testing? There's a brawl brewing in Lansing over which test will replace MEAP. The Michigan Department of Education (MDE) wants the Smarter Balanced Assessment (SBAC). Business Leaders and the Chamber of Commerce want SBAC. Lawmakers in the legislature are divided. Some want SBAC but others are concerned about cost and the loss of control if we go forward with SBAC. Given that they are in charge of funding, they have managed to challenge them through an appropriations bill that would require schools to use "new" MEAP. The MDE says that is not possible. To break the stalemate, Rep. Bob Genetski has introduced a bill, HB 5581, which would move the authority to determine the assessment from the MDE to the Treasury Department under Gov. Snyder. A hearing is scheduled tomorrow. I am sure the sparks will fly on both sides. But does changing the location break the stalemate and resolve the concerns of lawmakers and parents who dislike SBAC or "new" MEAP with SBAC content, and do not want to lose control of testing? I don't think so. Given Gov. Snyder's strong support of the Common Core and his alliance to the business community. it is reasonable to assume he will is for the SBAC assessment. But why are we forced to assume? Shouldn't we know where Gov. Snyder stands before we vote to give him the authority over the assessments? We already believe the MDE wants to stuff a "new" MEAP with SBAC content, would Gov. Snyder pull the same trick? Rep. Genetski's bill promises to give us more transparency but shouldn't we have that transparency either way? Why do we have to pass this bill to find out where the Governor stands? Gov. 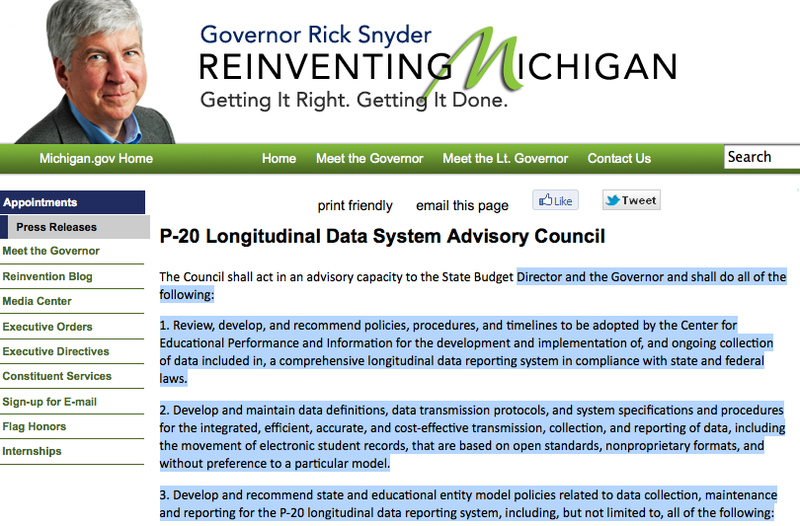 Snyder what assessment do you support for Michigan schools? Please contact the Governor's office TODAY at 517) 373-3400 and ask what assessment he supports for Michigan schools. Please let me know what they say. I have done many workshops and talks on the Common Core in the last year. I am routinely asked for my slides for future reference. I finally have it done. Thank you for your patience. These slides are for reference only. Please do no alter or duplicate. Thank you! Please note that the slides may be slightly different than a version. I am routinely updated and revising my slides as new information becomes available. You can also find me at Facebook to keep up on Common Core news and info. And also at Stop Common Core in Michigan. The United States is being transformed from a decentralized educational system to a national system from P-20 right before our eyes. In 2010, 45 states adopted Common Core, a standard of college readiness for math and English Language Arts. Logically, ONE common standard cannot have FIFTY state tests. 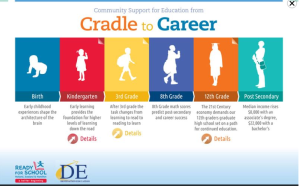 The question became what test would become THE Common Test aligned with the Common Core to provide the framework for the P-20 education to the workforce system? A little known but significant fact in answering that question is that the ACT and College Board were partners in the development of Common Core. ACT was already the test of choice in many states for their high school exit exam In 2012, David Coleman became President of the College Board signalling that College Board was also integral to the new P-20 system. Clearly, ACT and College Board were not going to just roll over and watch their companies crumple into pile of ovals and fade into history like the #2 pencil. But for the time, each state had its own assessments. Also worth mentioning, Pearson with CEO Sir Michael Barber, is a player who is "always learning" new ways to capitalize on common standards and assessments in the global marketplace. 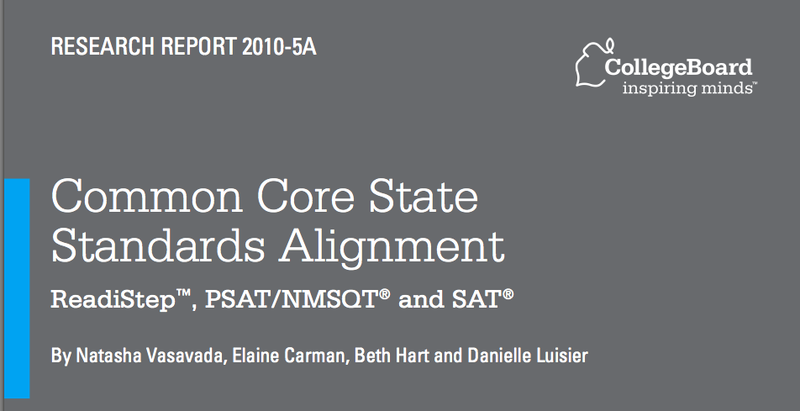 After the Common Core was adopted, two testing consortia were set up, SBAC and PARCC. Pearson was awarded the contract to create the new assessments. Remember "state-led" standards require the same cover for"state-led" testing. States now had a choice between SBAC and PARCC for their assessments. But ONE standard cannot have TWO tests forever and ACT and College Board are still around and working behind the scenes. College Board also announced a complete overhaul of the of the SAT and Advanced Placement (AP) Exams. In 2012, ACT launched ACT Aspire (with Pearson) to go along with their flagship ACT exam with WorkKeys. WorkKeys has been adopted by many states in order to grant a National Skills Readiness Certificate (NCRC) to students. So the stage is set for the common assessment pathway from P-20, education for the workforce but who will emerge the champion in the quest for the test? A year ago, Chester Finn at Fordham was very positive about the long-term prospects of ACT and College Board and predicted SBAC and PARCC would "fade away"
"eclipsed and supplanted by long-established yet fleet-footed testing firms that already possess the infrastructure, relationships, and durability that give them huge advantages in the competition for state and district business." So it should be not great surprise that many states are rethinking their participation in the consortia. Michigan adopted the ACT with WorkKeys as our high school exit exam in 2005 and is debating assessments. An ACT rep was present at hearing to let lawmakers know just how great the Aspire would be for our state. South Carolina is the latest to pull out of SBAC and adopted WorkKeys and considering ACT. EdWeek reports that participation in SBAC and PARCC is declining. "The most recent tally shows that 13 states do not belong to either the Partnership for Assessment of Readiness for College and Careers or the Smarter Balanced Assessment Consortium. 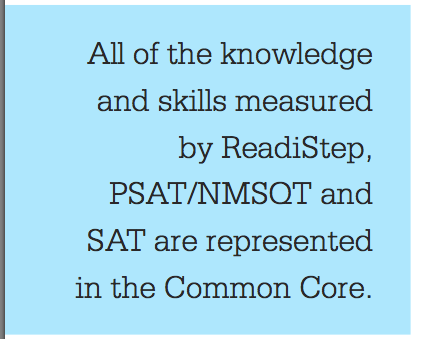 At the peak in 2010, PARCC claimed the membership of 26 states, and Smarter Balanced had 31. Currently, 16 states and the District of Columbia are sticking with PARCC, and 22 are in Smarter Balanced." ACT, with the full force of its reputation, is lobbying to be the test of choice for states and providing the cover against federalism. In the end states are still left with mediocre common national standards and assessment they do not control with a national work skills certificate (NCRC) as a bonus. Time will tell. The question we should all be asking ourselves is this, are parents and students ready to opt out of the ACT or College Board in order to defeat the Common Core and halt the transformation of education from P-20? If your child or children were prevented from getting into college because they didn't have the right credentials due to the fact that they were homeschooled would you still homeschool them through high school or would change what you are doing to meet those new requirements. Before you question the validity of question, let me give you a little more information. (I have so much research on this but finding it on the internet is difficult and time consuming.) Many schools disctricts are moving toward an "endorsed diploma" or "certificate of initial mastery" (CIM) as a part of a high school diploma. The NCAA no longer accepts coursework from 24 high schools. The high schools operate as virtual academies using K12. HSLDA Attorney Mike Donnelly posted a story about NiSource, an Indiana based company will not hire homeschoolers. "This applicant was offered a job initially, but NiSource withdrew the offer when it found out he had a homeschool diploma." While I acknowledge that K12 is "pubic school" it is still a "non-traditional diploma" and the same issues apply. In 2010, colleges were required to determine the "validity" of a high school diploma for federal funding. The validity of my own sons' diplomas were challenged by the US Marines. I know of other students who were rejected from cosmetology school and employment in heathcare field because they had a homeschool diploma. These stories are not isolated but part of a growing trend to standardize education and create a seamless pathway from P-20. Only those that meet the requirements set forth in this new system will be able to advance. The system is not complete yet, but Marc Tucker an early and strong proponent of a managed system for a managed economy describes the system based on exams or assessments.